It was nice to see two excellent pieces on Confederate items in last week's E-Sylum. I very much enjoyed the article reporting the upcoming auctions in 2015 of two of the four known Confederate Half Dollars – the first by Heritage in January and the other by Stack’s Bowers in March. I shall look forward to following these two next year. These comments are, however, directed toward the second item - Mr. Kent Whiting’s Davis Flight Medal. It is always rather exciting when another of these little treasures turns up, each one adding something to our collective knowledge of the whole. I coined the term “Davis Flight Medals” to describe these engraved coins from the very end of the War Between the States. They all came from the Confederate Treasury as it left Richmond to avoid capture and they are all are inescapably bound to the flight, pursuit and capture of President Jefferson Davis. Mr. Whiting’s specimen is an 8 Reals coin from 1861, engraved on the obverse at top “FROM GENL. JOS. E. JOHNSTON” – and in center “MAY/THE 1/1865”. The reverse is not shown but hopefully Mr. Whiting will provide us with an image later on. I believe this coin is from the $38,000 in silver left behind in Greensboro, NC as the Treasury Train passed through. General Johnston would use these funds to pay his Army. I’ve noted seven different locations and dates between April 3 and May 8th or 9th, 1865, where disbursements were made from the Confederate Treasury and coins thus paid out are each a potential Davis Flight Medal. Mr. Whiting’s coin is engraved May 1 - late for Army pay, but not too late! References tell us the Army was paid on April 28 (Friday). I’ve seen one coin dated April 25 (Tuesday), four dated April 26, and one dated April 27 – but none dated April 28. In addition to their pay, the veterans would each need a parole from the Federal authorities and these weren’t printed until April 30 (Sunday) in Greensboro and sent to officers for distribution. The Confederate soldiers received these over May 1 and 2, and began leaving for the long walk home on May 3 (Wednesday). 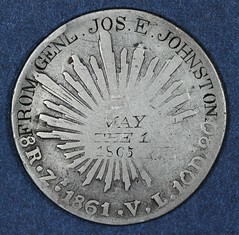 I therefore conclude that Mr. Whiting’s coin is indeed from the Greensboro army pay funds and note that Gen’l Johnston’s name engraved thereon is additional confirmation of this. The General’s name does not connect with the circumstances of any of the later Davis Flight Medals. At May 1, this coin is also the latest pay date I’ve encountered - too bad we don’t know the Confederate soldier’s name! Thanks for sharing with us, Mr. Whiting. This is also an excellent opportunity to address another feature of the Davis Flight Medals paid out to Confederate soldiers in or near Greensboro, NC. Some, but not all, of these coins are engraved “From General Johnston” – and a few follow that with “To” and the soldier’s name. I do not believe these were personally given by Gen'l Johnston! Now I suppose it’s ever so remotely possible that the General handed out a few of the coins but I believe it to be so improbable as to be hardly even worthy of mention (but - never say “never” - right?). What we do know is that when the Treasury Train left the silver coins in Greensboro, President Davis had also left instructions for the money to be sent on to him in Charlotte. General Johnston, however, felt it was more appropriate to compensate the soldiers who hadn’t been paid in a very long time. Accordingly the coins ($37,679.96 to be precise) were distributed to Regimental officers who took the money back to their men where they were encamped and divided it up the best they could. Some 32,174 soldiers were thus paid an average of about $1.17, some a little more, others a little less. I believe the soldiers knew that General Johnston had appropriated the Treasury Department funds to pay them and that is the reason for the “From General Johnston” engravings on the coins in question. Kent Whiting's May 1 1865 engraved 8 reales medal is in a distinctly different engraving style from the several pieces in my collection, all of which appear to be by the same engraver's hand.. 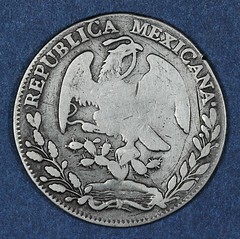 Lest readers wonder why such an engraving appears on a Mexican silver coin, the Confederate Treasury at the time of the War's end was almost exhausted and made up almost exclusively of silver Mexican 8 reales and a very few well-worn U.S. Seated Dollar coins. The Union paid off the surrendering Confederate rag tag soldiers from this treasury.